Let's improve NSBE DC together! 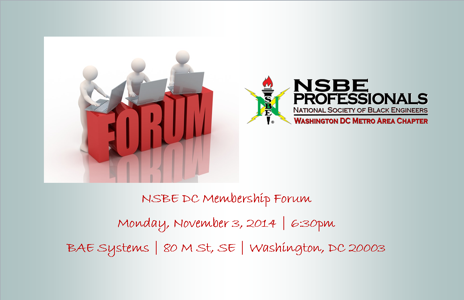 Join us for the Membership Forum on Monday, November 3, 2014 as we discuss opportunities for chapter improvement and plan for the future of NSBE DC! NSBE DC members, to help the chapter facilitate this discussion, please complete the membership survey online. If you have any questions or feedback regarding the forum or survey, please reach out to the Membership Chair, Richard White, at membership@nsbedc.org.